“Sprezzatura” is a word from the Italian Renaissance, coined by Baldassare Castigione in his The Book of Courtier, where he defined it as “a certain nonchalance, so as to conceal all art and make whatever one does or says appear to be without effort and almost without any thought about it”. 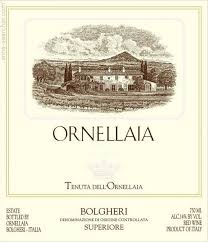 The word surely fits Ornellaia, one of the icons of the super Tuscan movement. Founded by Marchese Lodovico Antinori in order to compete with his cousin Nicolò Incisa’s Sassicaia, and his older brother Piero Antinori’s Solaia, since 2005 the estate has been wholly owned by the Frescobaldi family. Ornellaia has a reputation for opulence and sensuality more than finesse, when compared to the legendary Sassicaia, but it wears its age extremely well. The 2000 vintage is a blend of 65% Cabernet Sauvignon, 30% Merlot, and 5% Cabernet Franc. The 2000 vintage was notable for its hot temperatures and little rainfall and was judged too hot to produce elegant wines unless the vines were very carefully managed. The wine earned middling scores in the low 90’s when originally tasted but I think this is a case in which a wine can exceed expectations. I found it lovely given the type of wine it is–rich and opulent, in a rich, opulent vintage now drinking at its peak. Out of the bottle, without decanting, a dominant mint aroma melds with dark fruits, dusty earth, and loads of red raspberry preserve. As the wine opens up over the evening the mint recedes making way for smoky, roasted meat notes and darker fruits. The key to this wine is the silken, luxurious, mocha- inflected midpalate and seamless transitions juxtaposed with prominent earth that gives the wine a hint of dusty-roads-rusticity, although the sumptuous mouthfeel is as sleek and urbane as a Manhattan midnight. The refined tannins arrive late, building slowly like a seeping tide as dried fruit emerges, generating a long, ultimately drying finish. Full bodied without being weighty, this is a wine that begins quietly, unfurls with enough acidity to acquire intensity at its peak and hesitatingly fades never becoming loud or showy. As noted, this wine exudes effortlessness. There is little tension; just a quiet power that leaves an impression of graceful elegance. With 18 months in new and used French barriques, the oak is restrained and shows no hint of excess alcohol. Sumptuous yet poignant like Cassandra Wilson’s voice, sipping while listening to Fragile made the midpalate even more luxuriant.